However, for simple cooking tasks where a toaster can do the job you will often save time, energy and and money when compared to powering up the grill. So before you turn on the grill on your cooker think about whether the toaster in the corner could do the job just aswell. 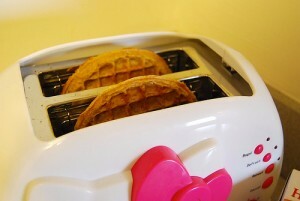 For easy breakfast type meals such as waffles, toast even croissants the toaster is the perfect companion. A traditional grill in an oven is far larger than is needed and will grill areas where there is no food, what a waste. Newer eco-friendly toasters have additional functionality which allows further combined use of the heat they produce. For example some toasters now have a rack above the main compartment where a croissant or pastry can be placed to gently warm whilst your waffles or toast are cooking.